I am an unica hija (only girl child) in the family, and if you think that is a good idea, hell, you are definitely mistaken because I am always asked to clean the house. I also wash the dishes sometimes, though it's my older brother's task. And because of the morning stresses and so much hand works every day, I felt like my hands became dry and rough, so I tried to look for products that will suffice the needed nutrients for my hands to go back to its normal smoothness. I think I'm am getting less and less hopeful until I found this product! As my friends and I went to Watsons last month, I found this secret treasure I've been looking for all my life lol. So yeah, it's been months and months of trying new hand products for my tired and almost lifeless hands until I get to try this lotion from Beauty Formulas! 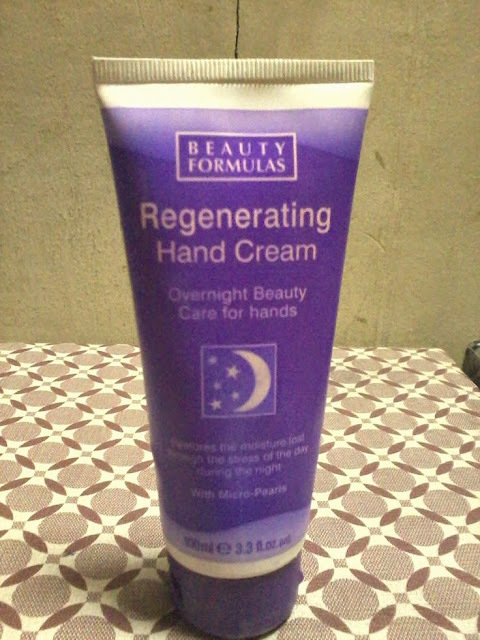 So today I am going to review the Beauty Formulas Regenerating Hand Cream: An Overnight Beauty Care For Hands! What it claims: Beauty Formulas Regenerating Hand Cream helps to restore and improve the condition of your hands and nails by working through the night. A rich non-greasy cream formulation which is rapidly absorbed into the skin with added benefits of micro pearls containing Vitamin E and A to moisturize hands and nails. Leave skin soft, smooth, and supple! One thing I love about it is the color of the packaging. It's a deep purple and I love purple! It's also very convenient to use since it is squeezable and comes in a tube packaging---what I always love in beauty products. The color of the lotion is opaque white with micro-beads. You can see the single bead on the formula. Hahahaha, The product has very few of these beads. I think if I open the tube, I will be able to count all the beads inside. Kidding. I guess the formula is best for those who loves nail polish like me since nail polishes and removers make the nails dry and dull! For only 124php per tube, the price is way cheaper than other nail moisturizer/treatment! The formula is very thick and moisturizing. You can already see the effect the first time of application. What I love most when applying the lotion into my hands is the time when I get to watch the beads dissolve and blend into the formula. And the best thing is felt the next morning! You'll definitely notice that your hands become softer and smoother you'll hesitate to wash or scrub it as you shower!